How Much Did Your Money Grow In 2014? If you put your money in a bank savings account, it grew by 1%. Actually, if you really want to be specific about it, it grew by 0.75% MINUS 20% withholding tax. So you earned something next to…uh…air. Okay, with some dust particles. But not my 5000+ TrulyRichClub Members. They’re extremely happy. How happy? When they see me in the mall or on the road, they rush to me and hug me tight. But when they say, “Bo, I’m a TrulyRichClub Member…” I know why they’re hugging me. Because I just made them richer in 2014. I can’t make promises that the same thing will happen next year. Because anything can happen-a comet hitting planet earth, or World War III breaks out, or, shucks, we get an alien invasion from the next galaxy. Today, I’m not writing to everybody.I’m specifically writing to people who want to grow their financial life-and who want my guidance in investing in the Stock Market. PS. By the way, the TrulyRichClub isn’t just about Stock Market investing. That’s only one part. In the TrulyRichClub, aside from teaching people how to grow in their financial life, I also teach people how to grow in their spiritual life. For what’s the use of growing in your finances if you lose your soul? 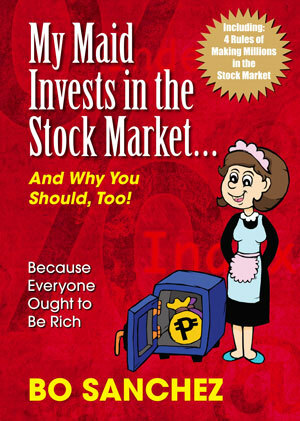 This entry was posted in Bo Sanchez, Stock Market, Truly Rich and tagged Bo Sanchez, Stock Market, trulyrich club on April 20, 2015 by Bobet Prudente.